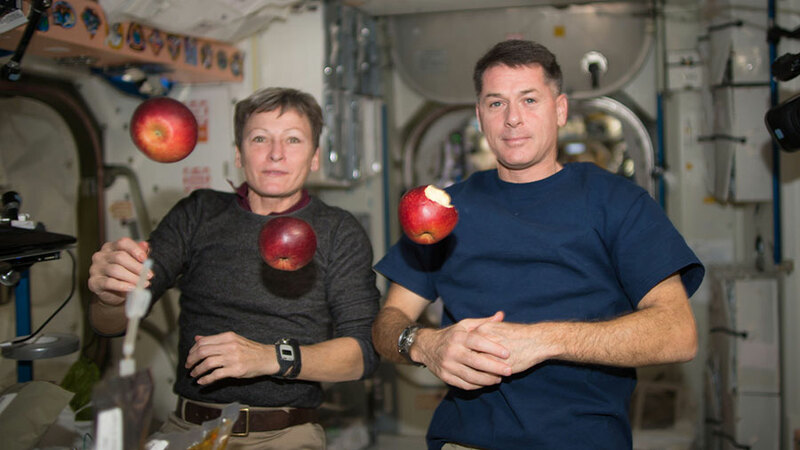 Expedition 50 crew members Peggy Whitson (left) and Shane Kimbrough of NASA (right) share fresh fruit that was recently delivered by the HTV-6 cargo vehicle to the International Space Station. The crew wrapped up part of a muscle research program today while continuing other experiments to study the effects of living in space. Also, a new CubeSat deployer was installed in Japan’s Kibo laboratory module. Scientists want to understand how the lack of gravity impacts muscles that aren’t used due to working in the microgravity environment. The Sarcolab experiment is one study that measures how the calf muscle changes in space using an ultrasound and electrode stimulators. The first part of that experiment was completed today as its gear was stowed and data downlinked for analysis on Earth. The station residents also explored how astronauts adapt to spaceflight conditions, the effects of a long-term mission on the human circulatory system and how charged particles behave in a magnetic field. An enhanced small satellite deployer was installed in the Kibo module replacing an older model that deployed its last CubeSat on Monday. The new CubeSat deployer has twice the satellite deployment capacity than the previous version. CubeSats scheduled for release from the new deployer will study a variety of space phenomena and enable advanced satellite communications. I was wondering about blood flow to and from extremities based on a report published a few years ago as a problem in low gravity environments. We use sequential compression sleeves in hospitals on bed ridden patients on calves, could these be used in space? Its pneumatic so air compression could be a problem not to mention tubes and powering the device… but just a possible idea? Happy Holidays!